This blog was not intended to report about war and violence, but the Syrian conflict is the most important event of the new millennium and its outcome will have repercussions all around the world. Not only does this war show the immorality and evil of Western leaders, who use religious fanatics to destroy a country which unfortunately happened to be in the way of their strategic plans, it also shows the depravity and wickedness of Western journalists, who use lies, fabrications, deceptions, and every possible psychological trick to justify the Western aggression against a sovereign nation. At the moment it appears that Western plans are failing and Syria will survive the assault. Though Obama, Clinton, Cameron, Hollande, Merkel will most likely not have to stand trial in a criminal court (a Damascus Tribunal), history will not judge them kindly, they have failed and will be disgraced and defamed. Ordinary people are more and more questioning the spoon-fed propaganda tales, they are rebelling against the political elites and voting for all the wrong candidates. This is the uprising of the “ignorant masses,” while the experts and insiders watch with horror. Independent journalist and bloggers can make a difference and provide alternative information as the traditional media outlets are discredited. Please view the reports about Syria on this blog as a small contribution to this process and not as a celebration of violence and war. At the end of October the Islamist militants from Idlib mounted a second offensive to break the siege of eastern Aleppo city. They gathered between 4,000 and 7,000 fighters west of Aleppo, less than in the August offensive, but still a formidable force. Turkey and the Gulf states had donated immense amounts of new equipment, including Grad rocket launchers, M72 LAW and Turkish HAR-66 ATGMs (antitank-guided-missiles), MANPADS (shoulder fired anti-aircraft missiles), communications equipment, flak jackets, and armored vehicles. The Islamists had gotten the best possible material and were boasting that they are now better equipped than Israeli special forces. The offensive was again led by Jabhat Fateh al-Sham (former al-Qaeda affiliate al-Nusra) and included practically all “moderate rebel” groups (Fastaqim Union, Sultan Murad Brigade, Ahrar al Sham, Jaish al Islam, Harakat Nur al Din al Zenki, etc.). 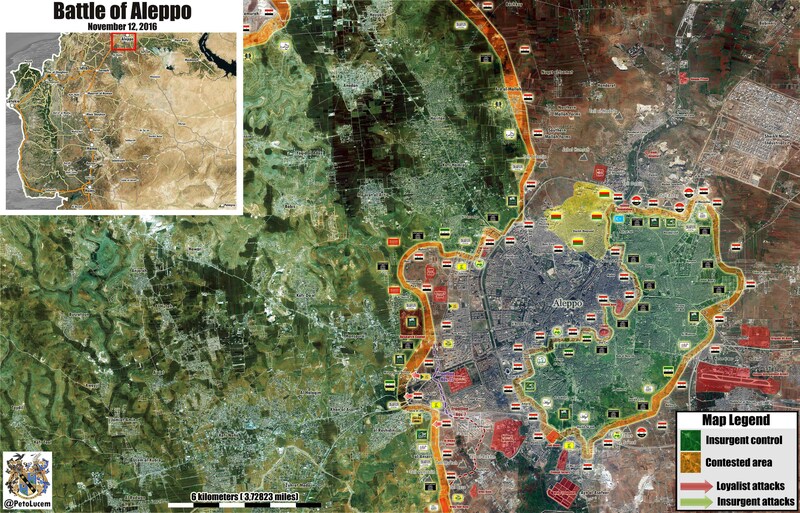 The Islamists attacked the western suburbs of Aleppo and conquered al-Assad district and Minyan district. From there they could have infiltrated New Aleppo, a densely populated area. Fighting in New Aleppo would have been a nightmare because more than hundred thousand civilians live there and would have been used by the Islamists as human shields. 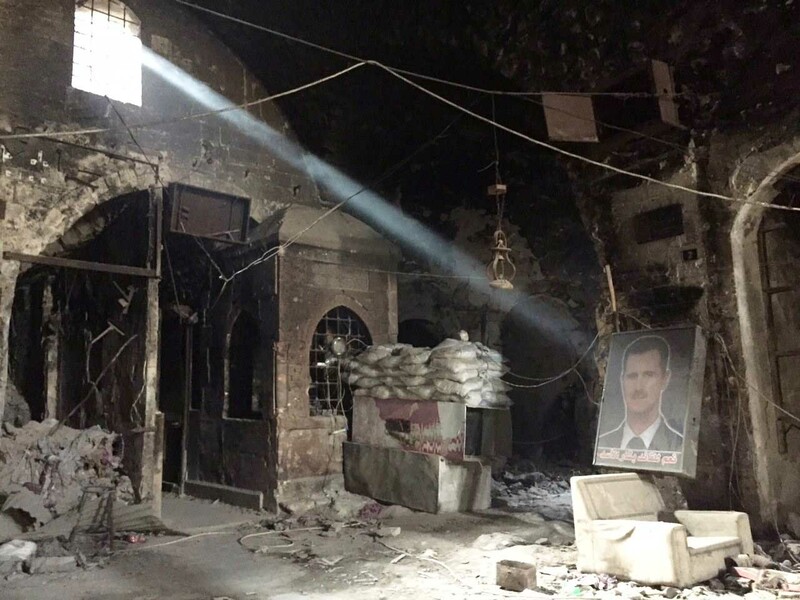 Mosques in besieged eastern Aleppo were blaring Allahu Akbar and the Islamists inside the eastern Aleppo pocket increased the bombardment of western districts with mortars and “hell canons.” This shelling was just plain terror, it had no military purpose, but caused civilian casualties and the destruction of buildings. In the last weeks at least hundred civilians have died in western Aleppo, even the UN bureaucrates could not close their eyes from this atrocity and called the shelling a possible warcrime. Fortunately the offensive was stopped on the third day. At least 12 SVBIEDs (suicide-vehicle-born-improvised-explosive-devices) were sent and waves of Inghimasis branded against the Syrian positions. Inghimasis is an accepted term for “shock troops not expected to survive,” they are very effective in breaking enemy lines because they just keep going forward with the sole intent to inflict as much damage as possible and they never retreat. This time the Syrian lines held. Most of the SVBIEDs were stopped by ATGMs before they reached the fortifications and the Inghimasis were mowed down in a hail of bullets, mortars, and other artillery. It appears that the attack from the western countryside was anticipated and the Syrian troops initially just fell back to more easely defensible positions in order to safe lives. Coinciding with the Aleppo offensive IS (Islamic State) had launched an assault on Kuweires Military Airbase which was also repelled. After the offensive against the western suburbs stalled, the Islamists tried to push forward in southwest Aleppo, using their hold in the 1070 apartment project to attack the 3000 apartment project. These were the positions they had taken in the August offensive. They failed to make any progress and after they run out of steam Syrian elite units (Tiger forces, Desert Hawks, Republican guard), aided by the exceptional fighters of Lebanese Hezbollah and Palestinian Liwa al-Quds started a counter offensive which not only reversed any gains the Islamists made in the two offensives, but conquered new ground and widened the security cordon around Aleppo. The rebels had announced their offensive long time ago, giving the Syrian army command not only enough time to prepare proper defenses but also time to plan for an extensive counter attack. There are speculations that this counteroffensive will continue towards Khan Touman in southwest Aleppo province or that it will head towards Kafr Hama and the Anadan Plains north-north-west of the city, ultimately to meet SDF (Syrian Democratic Forces) lines to reduce the length of the frontline around Aleppo. Ideally for the Syrian army a simultaneous offensive by the SDF south of the Kurdish Afrin canton (even if it were only a diversionary one) would draw away enough militants to cause the Islamists real problems wherever the main attack is directed. During the battle in 1070 the Islamists used chemical grenades but not a single western news channel reported this. The Islamists have lost more than 1,000 fighters in the first offensive and some 600 now. These were their best men, not only determined to fight to the death but also experienced — “battle hardened.” The Islamist groups will be able to replenish their ranks with new suicidal fanatics but the new recruits need to be trained and they need to gain experience. To send them into combat right away will be useless because the Syrian troops, experienced soldiers with high moral and confidence, will make short process and exterminate them as soon as they reach the battlefield. While the Islamists offensive was again militarily planned and coordinated from a Turkish control room, Saudi Sheikh Abdullah al-Muhaysini, the supreme Sharia law judge of Jaysh al-Fateh, was the media face of the jihadists. Jaysh al-Fateh (Army of Conquest), the Islamic militia that controls the city of Idlib, mainly consists of Saudis, Kuwaitis, Chech­ens, Tunisians, and Chinese. Sheikh Abdullah Muhaisny recently bemoaned that the loss of support for the jihadist movement in Syria is becoming acute: “Idlib is tired of the rebels and their infighting, and people are starting to doubt the Syrian Jihad.” Abdullah al-Muhaysini also released a video begging for Turkish university students to abandon their studies and come to Syria to replace the massive casualties the jihadists suffered in Aleppo. Interestingly most of the SVBIEDs drivers were foreigners from the TIP (Turkistan Islamic Party = Chinese Uyghurs) and Jund al-Aqsa (an IS-affiliate, recently absorbed by Jabhat Fateh al-Sham). 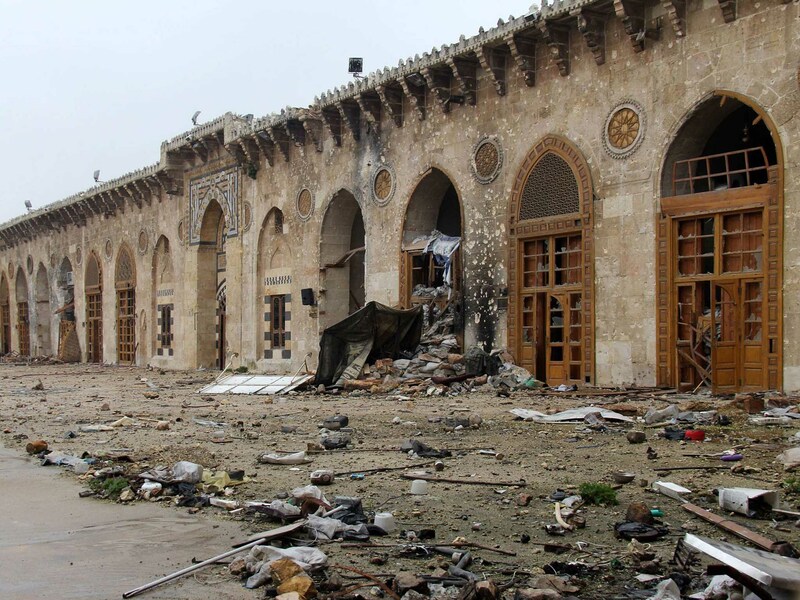 It seems that the suicide bomber pool of native Syrians is already exhausted. The losses of the Syrian forces were terrible too, but probably less than half of the jihadists bloodletting. The units are intact and new soldiers, well trained by Russian advisors, are constantly added to reserve units where they can gradually gain experience. It certainly seems that every month the Syrian army is becoming more disciplined and coordinated. The success of the Syrian army is even more remarkable considering that Russia since tree weeks has stopped airstrikes. Initially it was thought that the Russian air force will become active again after the US elections and after the naval battle group around aircraft carrier Admiral Kuznetsov, battle cruiser Pyotr Velikiy, and frigate Admiral Grigorovich has arrived. Yet, the elections are over, the Russian ships are at the Syrian coast, and there’s still no action. It could be that the military planners just wait for a surprising and devastating combined attack on Islamist positions — we will find out soon. The jihadists inside the eastern Aleppo pocked have not stopped shelling of civilian areas but made no attempt to break out. They were not even bothering to support their brothers attack on western Aleppo. Infighting between Fastaqim Union and Jabhat Fateh al-Sham with significant casualties is reported. There were also bloody clashes between Harakat Nur al Din al Zenki and Ahrar al-Sham. 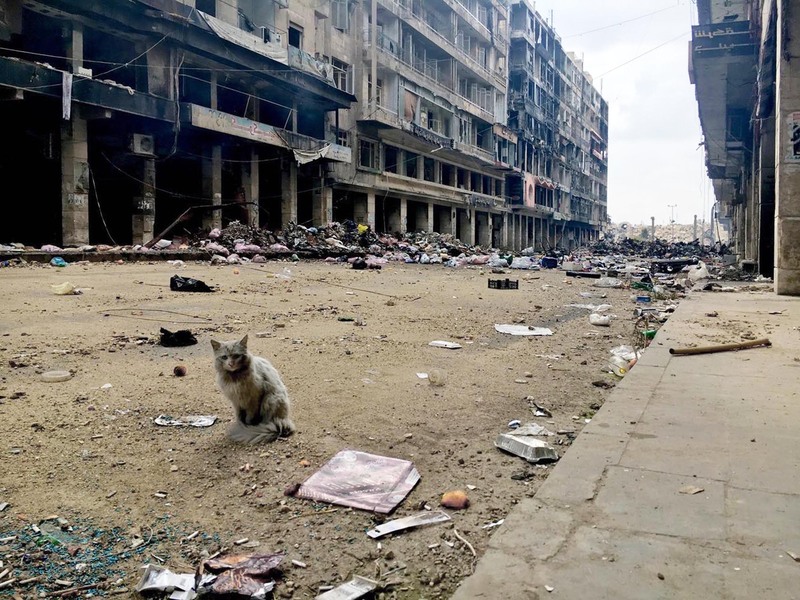 The Islamist occupiers of eastern Aleppo have apparently no offensive capacities left but they could still cause severe losses in urban street to street fighting. The Syrian government has again appealed with SMS messages and airdropped leaflets to take the offer of evacuation through dedicated corridors, describing it as a “last chance” to get out alive before the final assault on the pocket starts. The Syrian forces could just wait till the Islamists run out of supplies but the constant shelling of western Aleppo is a severe problem, it makes normal life impossible and causes severe harm. A few days ago shells landed at the University and killed five students. An independent journalist in western Aleppo last year went to the Aleppo Coroner’s Office (located at Aleppo University Hospital) and was told that officially documented 2,800 civilians were killed by shelling in western Aleppo between July 2012 and February 2015. The number will be now somewhere between 3,000 and 4,000. The Islamists had pinned all hopes on Hillary Clinton, who promised a no-fly zone and a tough stance (meaning war) against Russia. After their “savior” Clinton lost the presidential bid, they now hope that Turkey and Saudi Arabia will be free to even increase weapons shipments as Trump pulls the CIA out of Syria. They also point to Trumps transition team which includes war hawks Mike Rogers and Devin Nunes. Well, more weapons will not do the trick, as the two failed offensives against Aleppo have shown, and a devastating air war like in Libya is out of the question. The jihadists will be crushed, Syria will survive, though the healing of the wounds and the rebuilding of the country will take many decades.